Don Garlits celebrated the Fourth of July by inviting some of his old friends to his beautiful museum facility in Ocala, FL. Several hundred people showed up and renewed old aquaintances and practiced their bench racing skills. As the crowd munched doughnuts and coffee, Don interviewed many in the crowd that were in involved in various aspects of the early race scene in the Florida and especially the Tampa, St. Pete area. It all started in the parking lot with some current wild machines. The car above was used by Charlie Hogan to terrorize the streets in Tampa and St. Pete in the mid-fifties and recently the car was restored by Charlie's son and Don Garlits at Garlits restoration facilities on the museum grounds. Powered by an unusual Lincoln V-12 engine. This was the fastest car in the area until Don Garlits came along and put Florida on the speed map. Many of the old time racers from the early years were there and the lies were flying fast and furious. I saw many people there that I hadn't seen in 35 years, since the days of the Golden Triangle dragstrip in Oldsmar. Don Garlits was interviewing Ed Pantley and talking about how the starting systems have changed from the days that had a hand flagger and how he would intimidate the flagger. I was that flagger! Don Garlits has an absolutely fantastic museum complex and home here in Ocala, Florida and he opened up the facilities to his old time friends and foes for this 4th of July1996 Racers Reunion. We were able to tour the museum facilities and we will give you some teasers views. If you travel down interstate 75 in Florida, do yourself a favor and come see this fabulous drag racing museum and you will be amazed at what Don has assembled for your pleasure. In the first portion of the museum is almost all of the cars that Don raced in his career. Starting with the Swamp Rats. Many other famous dragsters are there such as the Mooneyes cars, the Speed Sport Special, the Bean Bandit, Jocko's Porting Service Special and too many others to mention, but you can spend many delightful hours looking at cars, dragsters, engines and auto related items from the early days. A new building, dedicated to the parents of Don and Pat Garlits, contains many fine examples of restored automobiles. Most people don't realize that Don is a fine automotive restorer and the quality of his work is apparent at the museum. 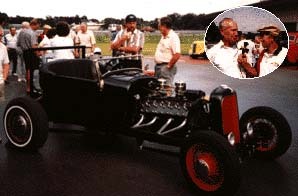 Inducted into the Don Garlits Museum was the "Israeli Rocket" owned by the Paul Shapiro, which was one of the original rear engined dragsters. In beautiful condition the car was an interesting set-up and original in concept. Garlits has really amassed a treasure of the important drag machines for display in his museum. It is amazing that so many of these machines survived, and it is a pleasure to stroll through the museum and see all the famous cars on display. Don was quite busy, but my wife Nancy and I had a chance to spend some time with Pat Garlits, and we were both impressed with how nice and gracious she is and how welcome she made us feel. Everything that you have ever read about Don and his accomplishments, Pat was there beside him every step of the way. I remember that the last time I saw Pat, she was driving the push truck to start Don on the strip at the Golden Triangle dragstrip. Now she is a grandma, and still doing it all with class and dignity. Thanks to Don and Pat Garlits for a wonderful day and a chance to relive some fine memories with the people that made them happen!